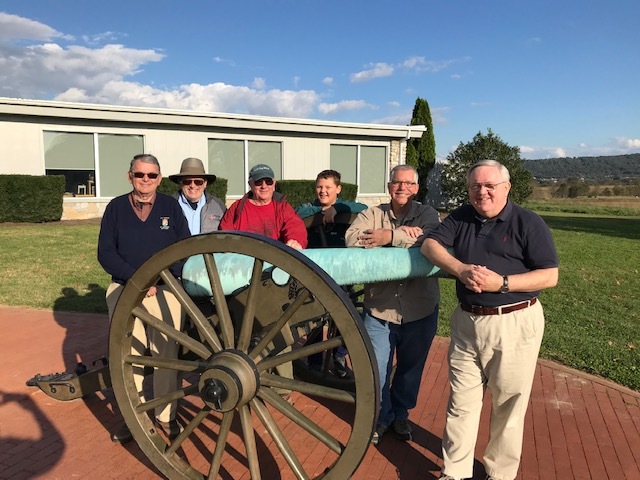 CWRT of Eastern PA took a field trip on Saturday October 20 to the Antietam National Battlefield in Maryland. National known historian and former NPS Ranger Dennis Frye led the group of almost 30 people on an incredible afternoon lecture and walking tour. We began with an overview of the battlefield, and then carpooled to the area at the Lower (Burnside) Bridge. It was here, on that day in September 1862 along the Antietam Creek, where Union forces began a flanking maneuver around the Confederate troops, while others of Burnside’s Corps were keeping the defenders occupied. We walked almost two and half miles along the creek, looking at terrain and talking about tactics used in Civil War battles. We found Snavely’s Ford, the place where 3,200 Union soldiers crossed and came around the Georgians. Once flanked, the Georgians holding the bridge were attacked and the bridge seized. Fyre described the time it took for the balance of his forces and artillery to cross the bridge, and then set up a line for their final assault on the Confederate right. Showing us where that final assault took place, he described the action as A.P. Hill’s Confederate forces arrived from Harper’s Ferry to disrupt the Union advance.